NASA’s Digital Learning Network and NASA Explorer Schools are hosting a special event and video chat on Nov. 2, 2012, at 1 p.m. EDT to commemorate the departure of space shuttle Atlantis. DLN hosts Rachel Power and Joshua Santora will broadcast live from NASA’s Kennedy Space Center in Florida as space shuttle Atlantis is transferred from the Vehicle Assembly Building to its permanent home at the Kennedy Space Center Visitor Complex. The “Roll Over” celebration will feature special guests including NASA Administrator and astronaut Charles Bolden, members of the space shuttle’s processing team and members of the team responsible for the design of the new home for Atlantis, who will answer student questions, as time permits. The chat will be live on the NES Virtual Campus. Up to 15 minutes prior to the start of the chat, go to the event page and click on the big red “join chat” button. Student questions can be submitted by typing them in the chat window, or through Twitter by tagging the tweet with #NESChat, or by emailing them to NASA-Explorer-Schools@mail.nasa.gov. Include the student’s name, grade and school name. Thefirst two of the 18 primary mirrors to fly aboard NASA’s James Webb SpaceTelescope arrived at NASA’s Goddard Space Flight Center in Greenbelt, Md. The mirrors are going through receiving and inspection and will then be storedin the Goddard cleanroom until engineers are ready to assemble them onto thetelescope’s backplane structure that will support them. To read more and see a video of themirrors’ arrival, visit: https://www.nasa.gov/topics/technology/features/webb-tech-mirrors-delivered.html. This information is a great extension to the NASAExplorer Schools live video chat with Dr. John Mather, a Nobel Prize winningAstrophysicist working with James Webb. Watch the archived video of thischat on the NES Virtual Campus. As part of a series of electronic professional development experiences, the NASA Explorer Schools and the National Science Teachers Association are hosting a 90-minute Web seminar called Heat Transfer: MESSENGER — My Angle on Cooling on Nov 1, 2012, at 6:30 p.m. EDT. Learn how the MESSENGER mission to Mercury takes advantage of passive cooling methods to keep the spacecraft functioning in a high-temperature environment. You will also see how to use the mission’s Staying Cool activities to lead students through an examination of different solutions to the problem of how to deal with too much sunlight and energy. This seminar has been rescheduled due to problems associated with hurricane Sandy. NSTA will contact everyone who registered for this seminar to let you know the new date and time. For further information visit the online registration page. From an altitude of 254 statute miles, external cameras on the International Space Station captured views of Hurricane Sandy at 11:16 a.m. Eastern time October 29, 2012 as it barreled toward a landfall along the New Jersey coastline. Significant impacts of storm surge and flooding are expected along the eastern seaboard from the Middle Atlantic states to New England. At the time of the flyover, Sandy was located 260 miles south-southeast of New York City, moving north-northwest at 18 miles an hour with winds measured at 90 miles an hour as a Category 1 hurricane, according to the National Hurricane Center. For more information visit the online registration page. 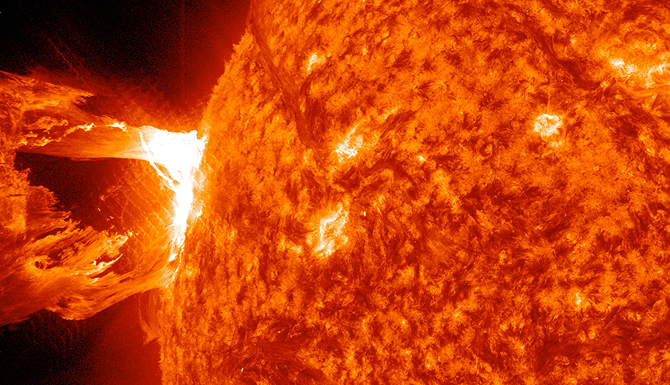 The sun emitted a significant solar flare on Oct. 22, 2012, peaking at 11:17 p.m. EDT. The flare came from an active region on the left side of the sun that has been numbered AR 1598, which has already been the source of a number of weaker flares. This flare was classified as an X.1-class flare. This flare did not have an associated Earth-directed coronal mass ejection. For more information and to register online, visit http://learningcenter.nsta.org/products/symposia_seminars/NES3/webseminar10.aspx. The sun’s atmosphere dances. Giant columns of solar material – made of gas so hot that many of the electrons have been scorched off the atoms, turning it into a form of magnetized matter we call plasma – leap off the sun’s surface, jumping and twisting. Sometimes these prominences of solar material, shoot off, escaping completely into space, other times they fall back down under their own weight. This information is related to the NASA Explorer Schools lesson, Geometry: Space Math Problems—Solar Storms. To gain access to this lesson, log into the NES Virtual Campus. To read more about the sun’s coronal cavities, visit the news page.